King Kullen’s Butcher and Meat Department; The best on the block; the butcher block, that is! We select only the finest cuts of beef, pork, poultry, veal, and lamb you’ll find anywhere. We work hard every day to ensure only the best meats make it into our stores and onto your family’s table. Try our Certified Angus Beef and organic poultry and taste the difference for yourself. We only carry the best Angus around, and we stock Bell & Evans, Plainville Farms, and Harvestland for the finest poultry. Did you know that all King Kullen butchers can custom cut any meat to order? Just ask at the meat counter and our butcher will be happy to prepare it any way you like. You’ll also find many ready to cook meat options, such as stir-fry, kabobs, pinwheels, seasoned chicken, and more. Don’t forget about our wide selection of chicken and turkey sausage, along with our frozen meats, burgers and bacon! We now offer food delivery options for our meat department along with all your other groceries. Learn more here. We carry only USDA Choice Grade Beef or higher because it’s the most flavorful and tender. You’ll taste the difference when you bite into King Kullen’s premium meats.Our butchers freshly grind beef every day. We are proud to bring you the Certified Angus Beef® brand – the best Angus beef available. The Certified Angus Beef® brand is a cut above USDA Prime, Choice and Select. Ten standards for quality set the brand apart and ensure each bite is abundantly flavorful, incredibly tender and naturally juicy. Taste the difference. There’s Angus. Then there’s the Certified Angus Beef® brand. We are proud to carry a full line of Smithfield grain-fed pork products in our Nassau & Suffolk County NY locations. Cuts include Center Cut Pork Chops, Spareribs, Tenders, and Boneless Pork Chops. Smithfield is a favorite of all natural fresh pork lovers. Smithfield pork products are produced without the use of antibiotics or growth hormones and are approved by the American Heart Association.Our smoked ham line includes Cooks, Hillshire, and Smithfield Smoked Ham Portions and Spiral Smoked Ham. We offer 32 varieties of fresh Perdue poultry in our Nassau & Suffolk County NY locations, as well as 21 breaded, cooked and frozen items. Founded in 1920, PERDUE ®is a family owned and operated company guided by three generations of leaders passionate about quality, integrity and trust since 1920. All PERDUE ® chickens are USDA process verified, raised cage-free and are fed an all-vegetarian diet with no animal by-products. PERDUE ® extends across a growing roster of products, combining our reputation for quality with convenience and reaching consumers across the country. PERDUE ® Harvestland is the number one brand of chickens raised without the use of antibiotics and is committed to providing simple, wholesome products. Raised on small family farms, PERDUE ® Harvestland chickens are USDA process verified, cage-free, fed an all-vegetarian diet with no animal by-products, and are raised without the use of antibiotics, hormones or steroids. PERDUE® Harvestland offers a variety of products, including USDA certified Organic under the PERDUE® Harvestland Organic label. The PERDUE® Harvestland mission is to bring fresh, wholesome food to your table, so you can feel good about the food you serve your family. King Kullen offers a variety of PERDUE® and PERDUE® Harvestland products that you can find in the fresh meat case and also in the freezer. Offering a selection of over 85 products, including fully cooked, organic, gluten-free, and whole grain (just to name a few! ), Let PERDUE® make your next meal a real winner! 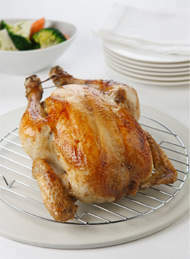 We offer a premium fresh poultry line of Bell & Evans. All are raised antibiotic free for your peace of mind. Bell & Evans is a family-owned and operated company that was founded in the 1890’s. Since their inception, they have been dedicated to supplying consumers with natural, antibiotic free chickens. All chickens are raised on all-natural vegetarian diets consisting of vitamins, minerals, soy beans and corn grown in the United States. Bell & Evans chickens are free of growth hormones, preservatives, artificial flavorings, and hydrogenated oils, providing you with the highest quality chicken. Bell & Evans also features a line of frozen meals and snacks including Gluten Free Nuggets and Tenders. All Plainville products are raised without antibiotics ever administered on an all vegetarian diet. From Shoulder Chops, Rib Chops or Loin Chops to whole or half Legs of Lamb, King Kullen is proud to sell only USDA Choice Grade American Lamb. American Lamb gives the consumer the taste and quality they expect and deserve. You’ll also find prepared meats in our butcher & meats department, ready for you to take home and cook. Cajun or Lemon Pepper chicken, stir fry beef or chicken. Kabobs with vegetables in 4 varieties – Beef, Chicken, Sausage or Pork. 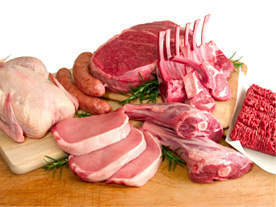 These are just a few of the items you’ll find in our prepared meat section. Americans eat 7 billion hot dogs during peak season, from Memorial Day to Labor Day. That’s 818 hot dogs per second. Nearly 6,000 were consumed in the time it’s taken you to read this far. Don’t forget that all meats continue to cook even after they are removed from heat. You may want to pull it off a few minutes before the meat has reached its desired “doneness,” as the meat will still cook in the time it takes to serve.